Over a period of 4 years the University of Reading Library is undergoing refurbishment. The marketing team required some graphics to be made to communicate important messages to the library users. 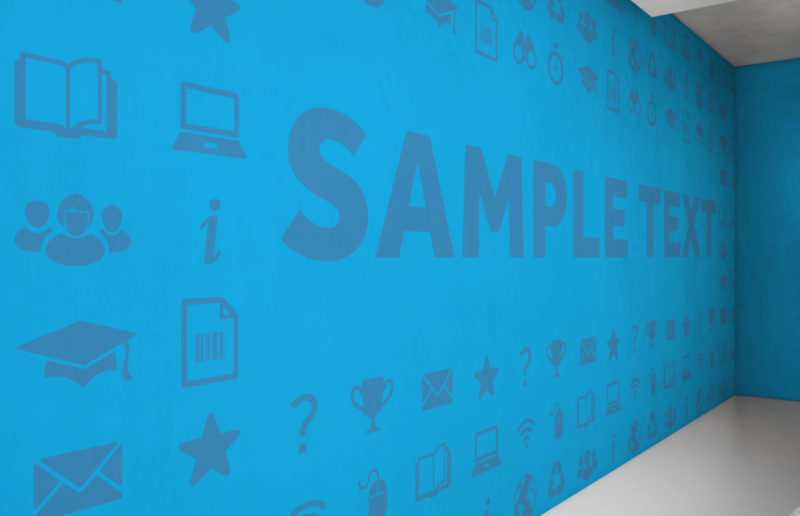 The graphics created needed to be incredibly diverse to work in a number of different situations including at large scale to cover false walls that would be put up during the redevelopment. They needed to help ensure that students, staff, and other users remain positive throughout the redevelopment process. 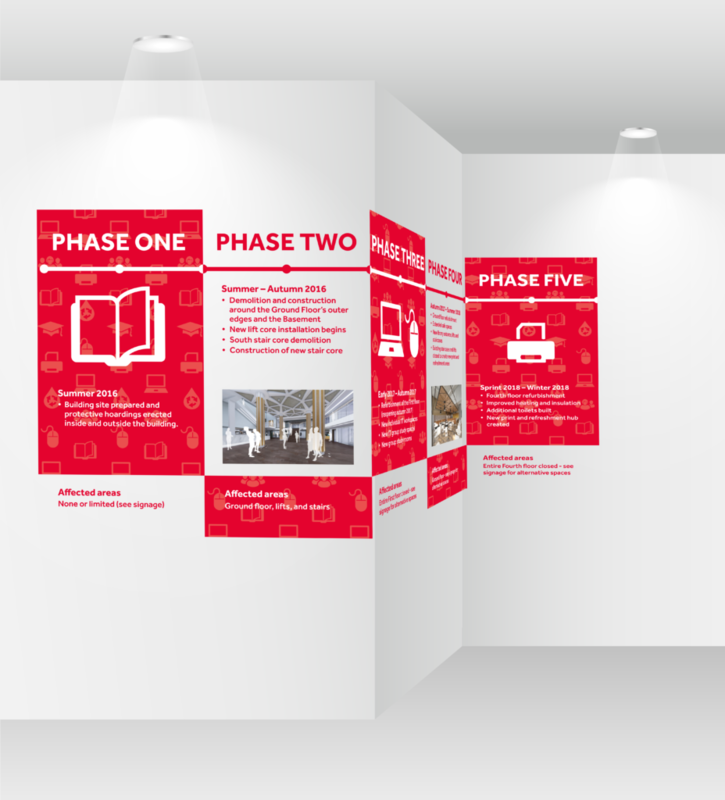 It was also important to our client that the designs could be easily adapted throughout the development of the library in case the timeline changed. Our team set out to create a number of different possible solutions to this problem that we could present to our client. 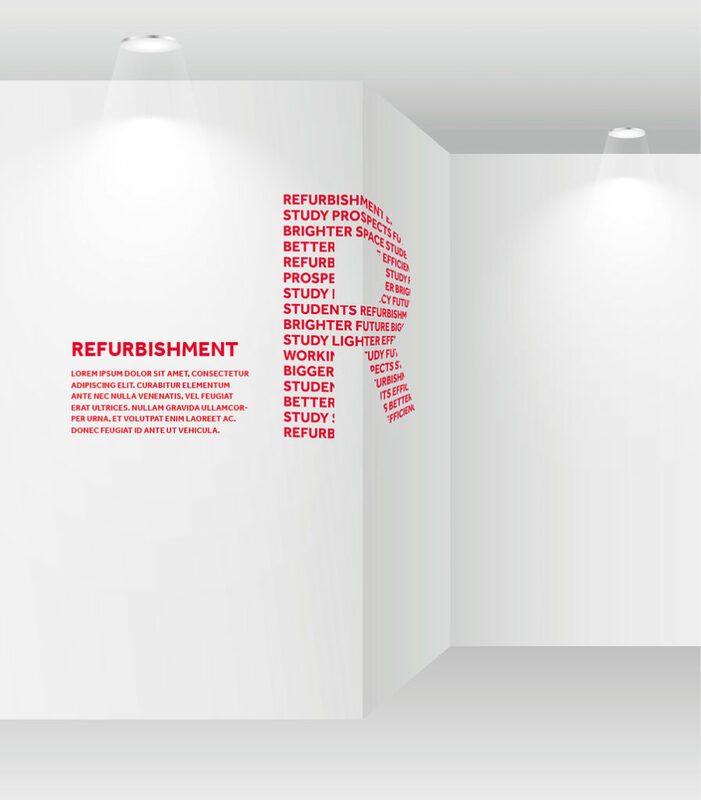 Designs for temporary hoardings to be used across all floors of the library. Designs to help provide information and sell the development of the library to existing and potential students for the reception area. Thoughts on how the designs could be extended into other elements. Much of our research centered around looking at the types of graphics being used in other libraries analysing how they were effective in communicating important messages to their users. We also spent time looking at how large-scale wall graphics were used, particularly finding inspiration in how timelines were used in some examples that we found. Wayfinding was also a key point of focus in this project, as areas of the library would be closed for lengths of time and collections relocated, we also looked into innovative ways of directing library users around an environment. We also got involved with a set of focus groups to see what students across various years thought of the library development. This gave us crucial information which we could go away and build our ideas upon. It also provided us with an insight into how people perceived the library and its redevelopment and which gave us some considerations to look into when designing our outputs. For example in one of the focus groups which was ran, all the students agreed that they would not want the colours used within the different library floors to be altered. 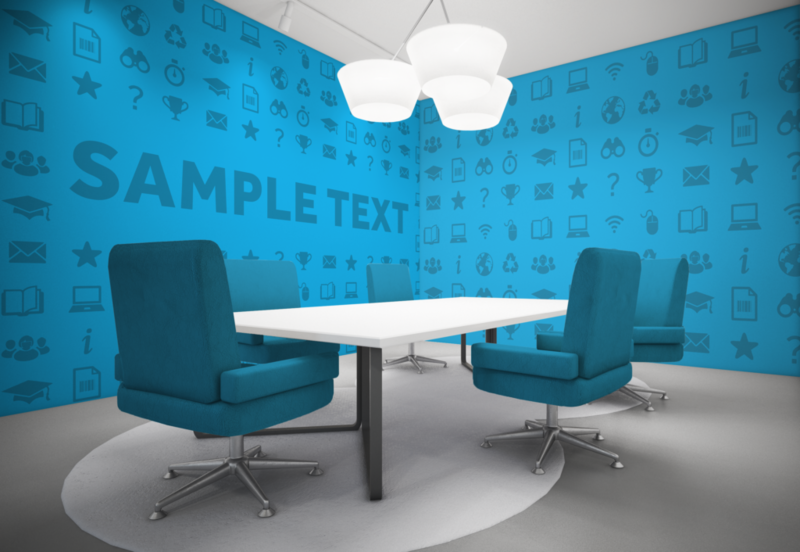 This was because users of library tended to spend a lot of time on one specific floor and felt comforted by the surroundings – changing these colours dramatically could potentially cause unwanted effects. This initial concept involved using a set of pictograms. These pictograms could be built upon on top of the existing pictograms in the university brand assets. Building upon these kept branding consistent with the university and created a system which could be easily evolve throughout the period of construction. These pictograms would then be used to create a pattern for the temporary hoardings in the library. The reason for going with a pattern it that it it helped reduce distraction to those studying in the library (reduced distractions was highlighted as an area of particular importance to students during the focus groups). Within these patterns motivational quotes or information about the library could be placed. This system could then be easily adapted to create a simple wayfinding system for students. The wayfinding system could then be used in conjunction with a set of pictograms to create a timeline for the project, giving the students an idea on when projects should be complete. Having a wayfinding system embedded into the walls also meant the that they would be easy to follow from a distance which is important when items in the library are in temporary places in which the students wouldn’t expect to find them. This concept also played on the fact that ‘Reading’ is spelt the same as ‘reading’. By placing this visual pun in the context of the University of Reading library, we thought it would be a simple way of making people look twice to understand the meaning. We also wanted to emphasise the fact that this redevelopment would benefit everyone and was ‘for’ the student to benefit from. When we pitched this idea to our client liked the concept of patterned pictograms but were less keen on the copywriting. They explained that they usually tried to avoiding confusion between ‘Reading’ and ‘reading’ and they did not think that this was as strong an idea as the pictogram concept. Initial concept for one of the temporary hoardings using patterns and pictograms. This idea centered around using large letters and number to draw attention to important facts and instructions. These large-scale type elements could be filled with buzz-words that relate to the redevelopment project to help create a positive atmosphere and a good attitude towards the construction work. Overall this proved to be very adaptable concept as it would be easy to change the colour scheme if necessary. We found out that it worked well alongside photographs so a wide range of media could be used. This concept could also build on top of the existing University of Reading brand guidelines as it would be based on top of the Effra typeface. 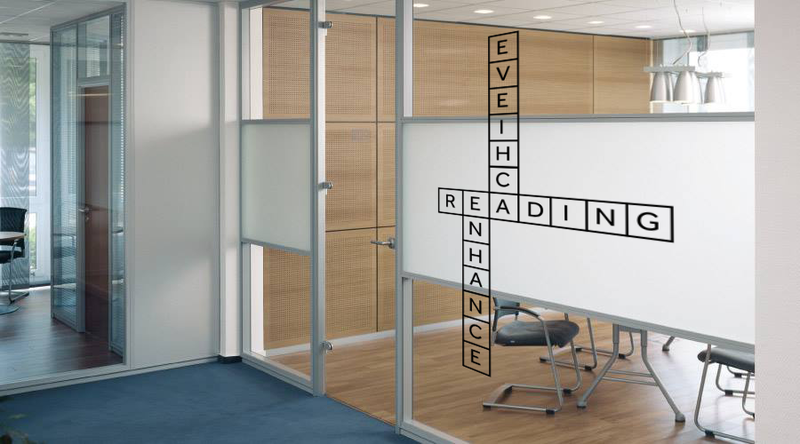 Again the client liked the concept of this but they feared that if the concept is used everywhere it could potentially be a distraction to those studying in the library. This concept aimed to make the library feel like a friendly place to be. The idea was that buzzwords could be placed inside a crossword like pattern, with a goal of creating buzz and excitement about the project. Each crossword could then build on the existing colour palettes for each floor. Following the feedback and discussions from our first pitch to the University team we settled on an approach which combined the ideas of the “Pictogram and patterns concept” and “Type within Type” concept. We then worked together as a group to bring these ideas to create one unified concept and explore other potential graphic outputs. One output that the marketing team were particularly interested in was how graphics could be used on the windows. Placing graphics on the windows meant that the distraction caused by workers moving around the outside of the library could be lessened, however it was also important to note that it was mentioned several times in the focus groups that the library should retain as much natural light as possible. 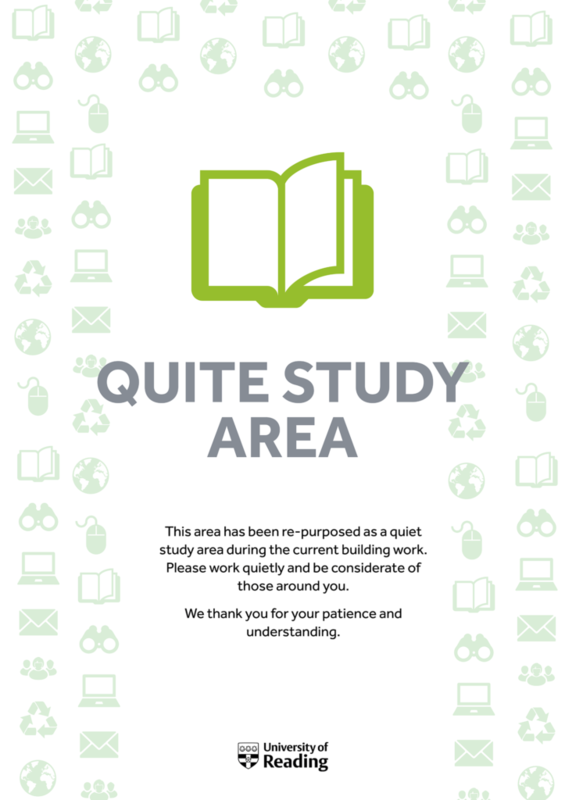 During this development we also looked at ways that this concept could work on smaller format handouts such as posters and handouts which could be left around the University campus. These handouts would go into details about the benefits of the libraries overhaul. A few days after pitching our developed idea to the client we were unfortunately informed by our client that they had decided to hand this project on to the internal University design team due to a shift in the proposed deadline date. The client however did inform us that enjoyed working with us and they thought the work that we produced was brilliant. While it is a shame that we did not get to see this project through to completion we all learnt a lot about pitching ideas to clients and designing for large-scale print projects such as hoardings. During the research stage we learnt the importance of getting insights from people who will be affected by the designed outputs through interview methods such as focus groups. These focus groups helped us create sensible graphic outputs for a campaign which would impact many people in a negative way. We also gained more experience in working with existing brand guidelines and generating numerous ideas for a project.